Counselling Directory was set up by a team who know how hard it can be to find the support you need. 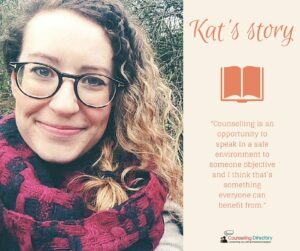 Today, Marketing Communications Team Leader, Katherine shares her story. In my teenage years I, like many others, became very aware of the way I looked. A couple of what should have been throwaway comments about my weight, stuck with me. When I was having problems with friends or felt unattractive, I blamed it on my weight. Although I wasn’t overweight, I quickly became fixated on how much I weighed and what I was eating. In my head, all I needed to do was reach the ‘perfect weight’ and everything would be OK. I began to restrict what I was eating in a desperate attempt to lose weight. My self-hate quickly escalated, and I began to self-harm too. I spent hours in bed because I was exhausted and soon my parents realised something was wrong. With their support, I began counselling – but didn’t feel ready to start ‘recovery’ just yet. What was so great at that time was being able to talk about something I had kept a secret from everyone for so long. My counsellor challenged my thinking and at times, it was difficult. 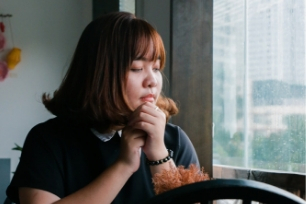 Later, when I felt ready to accept help, I was referred to a counsellor who specialised in eating disorders to begin a physical and mental recovery programme. As I didn’t meet all of the criteria for anorexia, I was officially diagnosed with an ‘eating disorder not otherwise specified’ (EDNOS). I remember feeling like I didn’t deserve treatment as I wasn’t ‘ill enough’. Thankfully as time went on during my treatment, I learnt techniques for overcoming my disordered thinking. What seemed like simple exercises at the time have become tools for me to use whenever things get on top of me. At the time, I didn’t tell anyone I was having counselling – it felt like an admission of weakness, like the bullies had won. Now, I feel like the stigma surrounding mental health is reducing and I am happier to talk about my experiences. I still get anxious from time to time, but now I feel like there are more resources than ever to help. I also know that counselling is always an option. It is an opportunity to speak in a safe environment to someone objective and I think that’s something everyone can benefit from. Working at Counselling Directory has opened my eyes even more to the positive effects talk therapy can have, which is why I wanted to write about my experience, in the hope that it will inspire others to ask for help, everyone is deserving. When you are going through a difficult time, it can be very easy to keep your feelings to yourself. While we all have ways of coping, information, support and talking about your worries can make a huge difference. For more information, visit our not sure where to start page and start your journey. Empathy and the counselling client What does 'normal' grieving look like?